MGM Springfield, a resort casino located in downtown Springfield that opened in August, features mixed-use development including a 251-room hotel, spa, pool and roof deck; 125,000 square feet of gaming space with 2,500 slot machines, 93 gaming tables, 23 poker tables, about 96,000 square feet of retail and restaurant space, 46,000 square feet of convention space; a multi-level parking garage & TopGolf Indoor Suite. SPRINGFIELD, Mass. – Unless you’re an avid basketball fan, Springfield, Massachusetts has probably never been on your radar as a travel destination. Home to the Naismith Memorial Basketball Hall of Fame. the city has offered few other reasons to stop there as you head toward New York City or perhaps to the Berkshires. 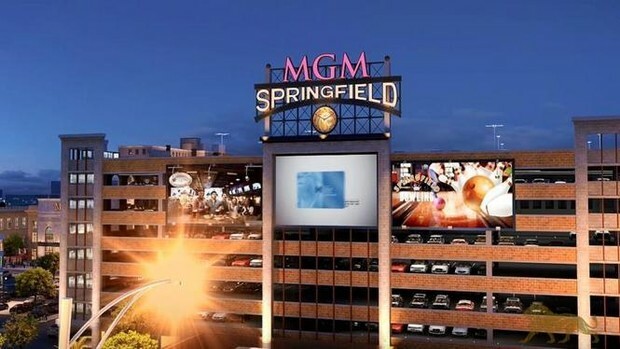 But Springfield is changing, thanks in large part to the presence of the new MGM Springfield, which opened its doors in August 2018. Located less than one mile from the hoop hall of fame and set in the heart of downtown, the state’s first casino complex features a 250-room hotel that includes two fine dining restaurants, a sports pub, a casual food court, four bars, a movie theater, bowling and a virtual golf facility. The region is home to numerous championship golf courses, and now visitors have an upscale hotel to use as their home base that provides more than enough entertainment to fill the hours after you walk off the 18th green. Befitting its location, the hotel has an industrial feel to the design. Dark wood provides a dominant theme the lobby areas and hallways, while brass light fixtures and wood floors give the rooms an intimate atmosphere. The décor also pays homage to the city’s history, including Springfield natives Dr. Theodor Seuss Geisel and Emily Dickinson. Metal tubing with glass lenses illuminate the hallways, reflecting Dr. Seuss’s glasses, and Dickinson’s words adorn the walls. They are just a few of the whimsical design elements in evidence throughout the hotel. You can play golf year-round at MGM Springfield at the Topgolf Swing Suite that offers a comfortable lounge to hangout while you enjoy food and drinks and indoor golf simulator with hours of operation: Mon – Thu	4:00 PM – 12:00 AM Fri – Sun	12:00 PM – 12:00 AM. The relaxed atmosphere, which stands in sharp contrast to the always-frantic noise of the casino floor, is most on display in the cozy lobby bar, where plush leather couches and comfortable high-back chairs make it seem like you’re sitting in grandma’s parlor. The Knox Bar and the Commonwealth Bar, both located just off the casino floor, also feature comfortable couches and chairs in a high-end setting. Unfortunately, dining options are somewhat limited. Cal Mare offers Italian, but feels a little like a cafeteria, while the South End Market is basically a mall-type food court. The Chandler Steakhouse is isolated and the best choice for premier dining, while TAP is a great spot for pub food and watching sports on the monstrous televisions on every wall. 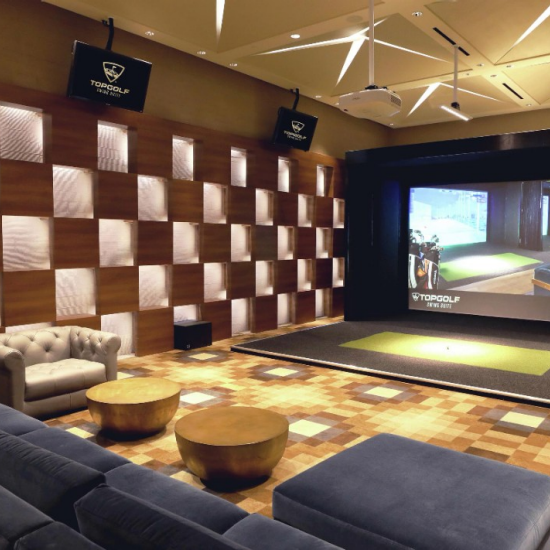 On rainy days or just as a warmup before heading to the golf course, book a private suite at TopGolf, where as many as 16 players can tackle the world’s greatest layouts in a virtual golf setting. You can also test your throwing arm in a virtual baseball setting, and even play dodgeball, while enjoying a beverage from the fully stocked bar. The Ranch Golf Club, located a few miles outside Springfield, is a must-play 18-hole golf experience when visiting Western Massachusetts, that features a well-groomed par 72 in the foothills of the Berkshire Mountain range. If you’re still in the mood for games, the TAP Sports Bar has an arcade with 10 lanes of ten-pin bowling, shuffle board, corn-hole, basketball hoops and other video games. Off campus, so to speak, don’t miss the basketball hall of fame, which is less than one mile from the hotel. The museum has three floors of memorabilia and interactive exhibits. After perusing the Hall of Fame room, which includes everything from one of Red Auerbach’s “victory cigars” and James Naismith’s original typed 13 rules of the game to the jerseys worn by such legends as Bill Russell, Michael Jordan and Jerry West and Bob Lanier’s size 22 basketball shoe. In the Media Room, you can test your acumen as a play-by-play broadcaster against Johnny Most’s call by providing the voice-over when John Havlicek “stole the ball” in the 1965 playoffs. You can also see what it feels like to be an anchor on ESPN’s SportsCenter. Finish your visit on a full-sized basketball court, where you can shoot hoops until the doors close for the day. In every nook and cranny of the museum there are videos showing the sport’s greatest moments and historical artifacts that will transport any basketball fan back in time. Golfers will find plenty of challenging courses in the area, perhaps none better than Crumpin-Fox Golf Club in nearby Bernardston, which is about 45 minutes from Springfield. A past host of the Massachusetts Open, this course sits on rolling terrain, framed by pine trees and features miles of breathtaking green fields. If has been honored in national magazines as of the Top 10 public courses in America and it has also been named one of the country’s Top 100 women-friendly layouts. The Ranch Golf Club, located in Southwick, is also a fabulous layout and has been ranked as the fourth-best course to play in the state. 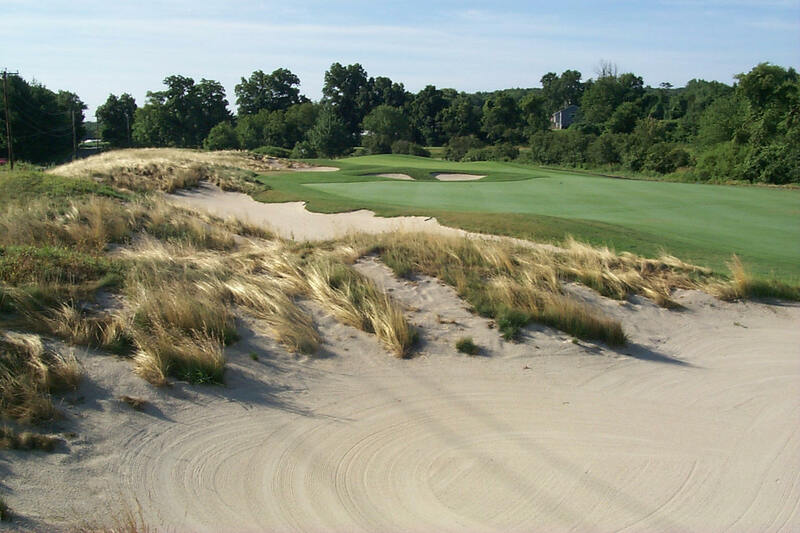 Opened in 2001 on a former dairy farm, the course is stunningly beautiful, with dramatic elevation changes and a variety of risk-reward holes. Located in the Pioneer Valley in Western Massachusetts, near the Connecticut River, Ledges Golf Club is owned and operated by the town of South Hadley since 2001 features 6,500-yards, 18-hole par 72 that winds through natural wetlands, some forests and farmland. The Ledges Club also opened in 2001 and sits in the Pioneer Valley in South Hadley, approximately a 20-minute drive from the MGM. The course offers magnificent mountain views as it winds through natural wetlands, mature forests and historic farmland. Crestview Country Club also sits in the Pioneer Valley, in Agawam, and provides plenty of challenges in a picturesque setting. Closer to home is the private Springfield Country Club, which was founded in 1897. If you can finagle an invite, you’ll be treated to pristine conditions with stunning views and among the fastest greens in Western Massachusetts. For years, Springfield was the city you drove past on your way to somewhere else. Perhaps no longer.